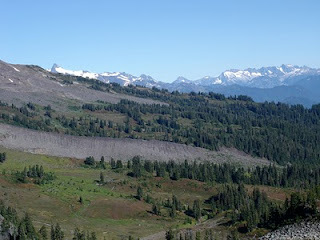 There was a crisp five-dollar bill staring up at me on the trail to Park Butte Lookout at the foot of Mt Baker. It was like an apparition, so incongruous in a place where you "leave it all behind". I snatched it up, pausing for a moment to think of how could I find its previous owner, someone who may not be able to have their coffee at the Starbucks in Sedro Woolley after hiking because their money fell out of their pocket. In just a moment, the vision of the woman who zipped down the trail passed through my head and I realized that a reunion would be impossible and so I pocketed it. Funny thing is, I had just pondered aloud as to how I could make hiking into a money-making business. "Writing about it, selling your book and photographs" were what I received as suggestions. A few minutes later, we came across two Forest Service employees taking a break, eating sandwiches beside the trail. I could work for the US Government, hiking trails, checking permits, cleaning backcountry toilets in a hard-to-get paid position. We made it to the Park Butte lookout which was occupied by a hiker who was a very gracious host. The lookout is first-come-first-serve as far as overnight lodging is concerned but visitors are welcome. Our host offered to take my poles as I made my way the last few steps up to the chunk of rock, then gave me binoculars to gaze out at every direction and also set out chairs so we could eat lunch in comfort. He asked me, "you probably found a five-dollar bill on the trail, right?" and my first thought was that maybe he had passed it over. I admitted that I had and, once I realized it had fallen from his pocket, I dug it out and handed it over to him. 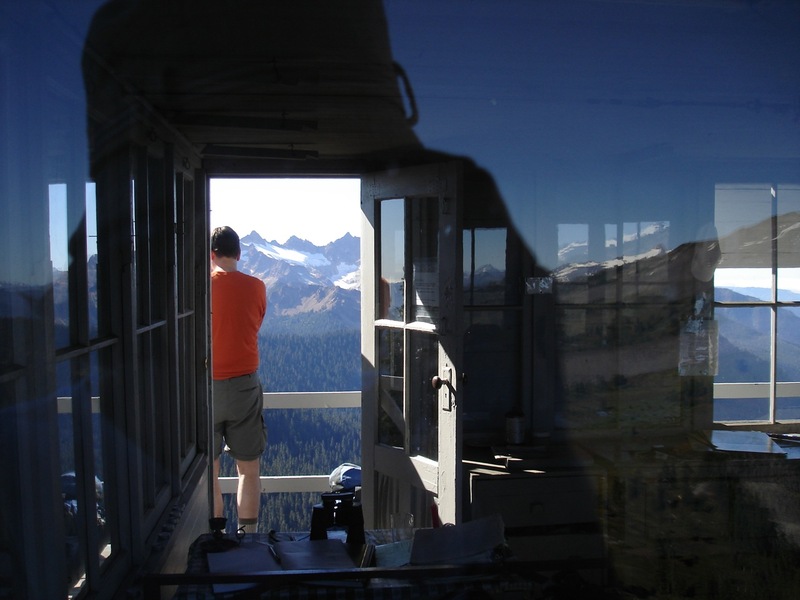 His intention for the bill was to make a donation to the Skagit group who maintained the structure and kept donation envelopes in the lookout. There went my trail bounty but I was pleased it was going to a good cause. We reluctantly left the lookout since daylight was waning and ran into a heavily laden backpacker making her way up to camp. She mentioned that the bridge we had crossed over Rocky Creek, a torrent of silty, mud-colored water that gushed down from the Easton Glacier had been dismantled, yet she was still able to cross it by doing this and that and held her hands in a cross-like position. 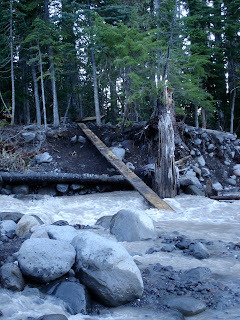 It seemed that those "paid-to-hike" Forest Service folks had dismantled the bridge with them when they hiked out, not warning us or even making jokes how low our boots came up on our legs. Why was this day, Wednesday, September 29 significant? They couldn't have waited until the end of the month or at least given any warning at the trailhead? We arrived at the creek at the same time two climbers had arrived on the far side. They wore gaiters, plastic boots and had massive packs with rope and climbing helmets. We watched as they tried to detour downstream to find a crossing, then retreat back toward the trail. We tried to communicate with them but the deafening sound of the creek made that difficult. The few words we did understand was that they were going to bag their climb and "good luck". My thoughts went to my car, its heated seats, the cookie I had left for us on our return, dinner somewhere on the way home. I wanted to be at that car, yet a raging torrent stood between me and those things. Suddenly, my hiking partner barked out orders to get into the creek, hold on to the log for balance and stability and walk slowly across to the other side. He was hungry, too! He went first and, when he wasn't swept away by the current, my fears subsided. Soon, I was knee-deep in water that wasn't nearly as cold as I thought it would be and I began to laugh once I reached the other side, mostly from relief but also from the thrill of the unknown. Boots soaked and feet sloshing, we made our way down to the trailhead, ate the cookie, heated up the seats and headed for dinner. 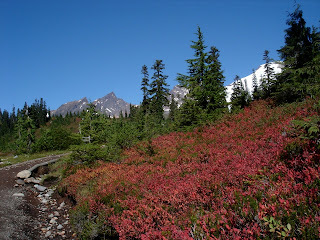 We were grateful for the day in the mountains we had been given and for taking the path of least resistance. I really enjoyed your story and photos!